Free download Wise JetSearch latest version. You just need to input your keywords, select the drive you want to search and then click the search button. Wise JetSearch will search for you automatically and then show you the basic details of the file/folder. Since it didn’t create an index like everything, it can find the file immediately. It is much faster than the built-in search feature in Windows. 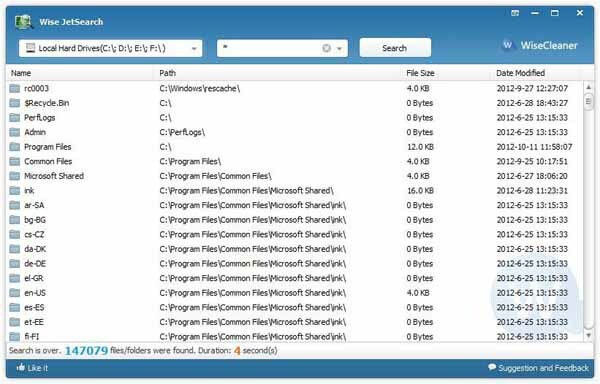 Wise JetSearch enables you to search all of your available hard drives and partitions – such as secondary drives, USB drives and other disks. It does not matter whether the drives you are searching are formatted as NTFS, FAT or FAT32 drives as Wise JetSearch supports all of these formats. Wise JetSearch allows you to specify the file you’re looking for along with some wild cards. If you are not sure of the file/folder name, you can use *or ? to replace the letters you don’t remember. It also provides you with easy wild card selection like images, videos, archive, email, etc. You can select one file type and then the Wise JetSearch will automatically fill up the field with the necessary wild card text.